The Wedding Sisters tells Meryl Becker's story when her three daughters are getting married at the same time. We shift POV from Meryl to each of the three daughters so we get to know each character well while reading. We start the book with Meryl and her husband celebrating their oldest daughter, Meg's engagement and each family meeting one another. I loved seeing all the little details that come along with two different families meeting for the first time and it felt true to life. 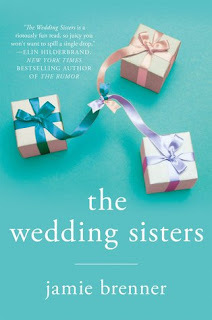 Meryl is struggling with keeping the wedding how she wants it for her daughter since Meg is marrying into a wealthy family that just wants to have things their way. Then we find out about the other two sisters getting engaged and Meryl is going to have to go into hyper speed mode to plan the weddings for all of them. That's when Meryl comes up with the idea of doing a triple wedding. Don't you know there is a ton of drama along the way! It made for a very entertaining read. I appreciated that JBrenner wrote the story the way she did. With the alternating POV, we got to know each daughter and their issues. Meg is the oldest daughter, she's the one viewed as being perfect and is set to marry a lawyer that comes from a very wealthy family. Amy is the middle daughter and is going to marry into a wealthy family as well that is in the fashion industry. And then we have Jo, a semi-former lesbian that is dealing with a rough break up with her girlfriend and her rebound is a close male friend. They wind up getting closer as she's dealing with the breakup and one thing leads to another and they're engaged as well. He's uber wealthy as well so all three girls are marrying into prominent families. The Wedding Sisters had a ton of drama, I wasn't sure what would happen next and it always kept my interest. The only thing I didn't fully enjoy in this story were the one or two scenes where a character cheated. So if you're not okay with that in books, I'd say steer clear. Otherwise, it was a light read that had me wondering if all the girls would get down the aisle. I recommend this book if you're a fan of women's fiction or chick lit. Did all three make it down the aisle? I kind of hope not all of them did. I'm not telling haha ;) I was hoping the same thing though while reading! I wonder if the cheater made it down the aisle, haha. oh I do love it when a story keeps you guessing and is unpredictable. Glad you enjoyed this one. Oh nope nope nope. I really appreciate the cheater warning. I'm not down with that at all. I'd be wanting to do some harm to some peoples I think. lol especially with it wedding themed. Whew!